Lorne Sossin is the dean of Osgoode Hall Law School at York University in Toronto. Last september, Chief Justice of Canada Beverley McLachlin hosted a dinner in Toronto for retiring members of the Canadian Judicial Council. 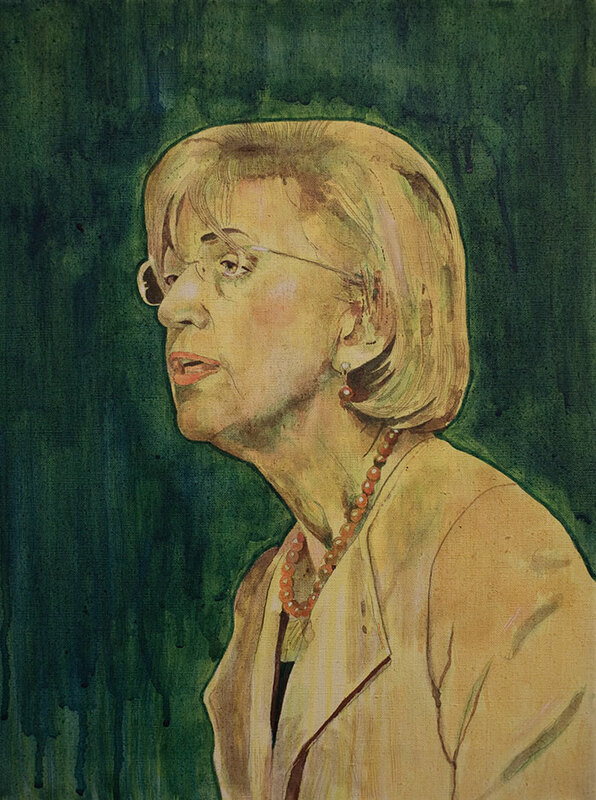 McLachlin had just introduced former Ontario chief justice Warren Winkler (who happens to hail from the same small town of Pincher Creek, Alberta), when she paused and took back the microphone. In the spring, she said, she had found herself sitting alone in her basement office, “feeling a little blue,” when “Wink” called. He had just acquired a Labrador retriever puppy and thought the breeder might be persuaded to part with another from the same litter. “Was that Wink on the line? ” asked her husband, Frank McArdle. McLachlin was between dogs and not sure she was ready for a new Lab in her life. “Get the damn dog,” said Frank. The room erupted in laughter and applause. Even Canada’s minister of justice and attorney general, Peter MacKay, sitting gamely at the head table, joined in. We all knew why she might have needed a puppy last May. It’s tempting to say that the saga began with the government’s nomination of Federal Court of Appeal justice Marc Nadon to the Supreme Court of Canada on September 30, 2013. But another key date was July 29, 2013, when McLachlin met with the parliamentary committee putting together a short list of potential nominees to fill one of the three slots reserved for justices from Quebec. Two days later, the chief justice’s office allegedly reached out to MacKay and the prime minister’s chief of staff, Ray Novak, to flag a potential issue with the appointment. McLachlin and MacKay spoke. The issue was flagged. Drama ensued. Federal Court judges have been elevated in the past (most recently in the case of the Harper government’s very first appointment, Justice Marshall Rothstein in 2006), but none had ever been promoted to fill one of the three spots on the Supreme Court reserved for current members of the Quebec bar, the Quebec Superior Court, or the Quebec Court of Appeal. Justice Nadon was from Quebec and had practised law in the province for almost twenty years before his appointment to the Federal Court, but he was neither a member of the Quebec bar nor a judge on the courts specified in the Supreme Court Act. In an unusually pre-emptive move, the government announced that former Supreme Court justice Ian Binnie had provided a legal opinion that there was no obstacle to Nadon’s appointment; former Supreme Court justice Louise Charron and constitutional scholar Peter Hogg agreed. In other words, three luminary legal minds all agreed Nadon was sufficiently Quebecish to be eligible. McLachlin swore in Nadon on October 7, 2013, the same day lawyer Rocco Galati launched a lawsuit challenging the appointment of a sitting Federal Court of Appeal justice to fill a Quebec seat. (Galati had already successfully challenged the practice of allowing retired judges of the Federal Court to continue to serve on a per diem basis because, as he pointed out, the Federal Court Act precluded them from serving past the mandatory retirement age of seventy-five.) A few weeks later, the Quebec government joined Galati’s suit. Ottawa asked the Supreme Court to provide an opinion on the legality of the appointment, in a move unprecedented in Canadian legal history. Justice Nadon decided not to take his seat until the matter was settled, and Justice Marshall Rothstein, who had served as Nadon’s colleague on the Federal Court of Appeal, recused himself. While the legal challenge centred on Nadon’s Quebec status, the broader (or possibly deeper) issue was the whiff of partisanship accompanying the appointment. Nadon is liked by those who know and work with him, but few would have placed him in the top tier of judges with the qualifications for the highest court in the land. Stephen Harper, in struggling to find a field in which Nadon had distinguished himself as a jurist, referred, obscurely, to admiralty law (though, to be fair, qualifications for a Supreme Court appointment are often in the eye of the beholder). What attracted far more attention was one of his best-known judgments: a dissent in the Federal Court of Appeal decision in the Omar Khadr case, in which Nadon sided with the government. In a remarkable rebuke, the Supreme Court held Nadon ineligible for an appointment to the Supreme Court (Justice Michael Moldaver dissenting). Of the six justices in the majority, the Harper government had appointed three. Neither the Prime Minister nor the Minister of Justice would ever call a sitting judge on a matter that is or may be before their court. The Chief Justice initiated the call to the Minister of Justice. After the Minister received her call he advised the Prime Minister that given the subject she wished to raise, taking a phone call from the Chief Justice would be inadvisable and inappropriate. Asked to comment, I told a reporter that the chief justice had been put in a difficult position. Given the constraints of her office and the need to remain above the partisan fray, she would not be able to defend her integrity. Then a tweet popped up on my phone: “Chief Justice hits back!” So much for judges not being able to stand up for themselves. Given the potential impact on the Court, I wished to ensure that the government was aware of the eligibility issue. At no time did I express any opinion as to the merits of the eligibility issue. It is customary for Chief Justices to be consulted during the appointment process and there is nothing inappropriate in raising a potential issue affecting a future appointment. The statement was hardly inflammatory, but it directly contradicted the PMO’s account and stoked the he-said-she-said dynamic. And so it went. Heels were dug in. The ensuing stalemate has yet to be broken, though the chief justice has recently referred to turning the page on this controversy. While some share the government’s view that sitting judges should have no role whatsoever in the nomination process, I cannot think of credible independent observers who feel the government raised this concern in a fair and appropriate way. But even if the chief justice is in the right, she had far more to lose in this contretemps. Without the trust and confidence of the government, one of the court’s most significant assets is damaged goods. The court’s authority derives precisely from its impartiality and its ability to command the trust of all those in the fray, no matter what their partisan stripe. So, the question now is: Can the damage be repaired? And, if so, how? The Tories were, I think, genuinely surprised by the Supreme Court’s Nadon judgment. People like Ian Binnie, Peter Hogg, and Louise Charron do not attach their names to a position lightly. The court’s decision appeared to be rooted in respect for the Constitution and the integrity of the Supreme Court Act, but some questioned why a judge of the Federal Court of Appeal, especially one appointed to reflect a Quebec perspective, would ever be considered ineligible for one of the province’s seats on the Supreme Court. Some Quebecers say the issue was one of respect for an entirely different system of justice—civil law—in which all members of the Quebec bar and Quebec courts have expertise and few members of the Federal Court do. Still, applying this logic to a judge who had practised in the province for close to twenty years seems a bit of a stretch. And as dissenting Justice Moldaver observed, the technicality had a simple solution: Nadon might have simply resigned and become a Quebec lawyer for a day to be fully eligible. As the Nadon affair gathered steam, the Tories seemed to take each judicial setback almost personally. The Supreme Court ruled against part of Canada’s anti-prostitution laws in the Bedford ruling at the close of 2013, and held that a section of the Abolition of Early Parole Act was unconstitutional. The Conservatives’ plan to appoint only senators who are elected was once again derailed by the court; such reforms would require the agreement of at least seven provinces representing 50 percent of the population. The court rejected changes to the Senate without constitutional amendment. That the Supreme Court is prepared to flex its constitutional muscle in the face of Conservative policy is certainly not news. In 2011, it compelled the feds to allow the Insite needle exchange in Vancouver to keep operating, and stymied their plans for a national securities regulator. And the Supreme Court’s activism (if we can call it that) has not been limited to the current government. The court has found laws of successive Liberal governments unconstitutional, too, and was arguably at its most adventurous in charting the broad scope of the Charter of Rights and Freedoms in the late 1980s during the Mulroney era. But such activism has never before been linked to partisanship. Now, however, such rulings have become stylized as Harper v. the Court. Journalists report (as I did above, in relation to Nadon) who appointed the particular justices who join majorities or dissent from a contentious decision. A partisan era has a habit of turning every case into a partisan one, whether it deserves to be seen as such or not. Judges must shoulder some responsibility for the current zeitgeist. Striking down laws as unconstitutional is one thing, but openly defying government policy is quite another. In fall 2013, several judges defied the newly minted and unambiguously titled Increasing Offenders’ Accountability for Victims Act. Judges are supposed to impose a 30 percent surcharge on any fines associated with a conviction (or if no fine is set a flat fee of $100 or $200). Ontario justice Colin Westman referred to the policy as a tax on “broken souls” in the Toronto Star, and began imposing $1 fines to effectively nullify the mandated fees. As with the opposition to the 2009 Truth in Sentencing Act, which reduced the credit given for time served before sentencing, the undermining of the Increasing Offenders’ Accountability for Victims Act exacerbated the tension between the government and the judiciary. (Some judges simply altered sentences to negate the impact of the new measure; the Ontario Court of Appeal struck it down in September 2014.) It also demonstrated how difficult it was for judges and politicians to have constructive conversations, outside of press releases and media scrums, about the justice system and the aspects that they may agree to disagree on. Partisanship is a two-way street—or, more accurately, a spaghetti junction with myriad on- and off-ramps and lots of distracting billboards. Many judges do not like the Conservative government’s platform, particularly its tough-on-crime agenda. But this is not a fringe or marginal policy; it is one of the core (and most popular) planks. The Tories find support in a public that seems to question the justice of criminals not serving the actual sentences they receive, and the accepted law-school wisdom that we would rather see ten guilty people go free than one innocent person imprisoned. How would that proposition poll the day after a terrorist attack? One could read recent legislation that reduces judicial discretion in sentencing and victim surcharges as a reflection on the Conservative government’s mistrust of the judiciary, which left to its own devices will privilege compassion for perpetrators ahead of justice for victims of crime. To the extent that the courts articulate or reflect social values (a key aspect of constitutional analysis in Canada), those values seem more and more out of step with Conservative policies. In a strange way, this may well reflect the system working as it should. Governments are elected to reflect majority will; courts are independent in order to assure minority rights and the protection of the rule of law—even, and especially, in the face of democratic fervour. The way in which partisanship has come to shape our justice system is evolving in the shadow of a cautionary tale to our south. The American justice system is rife with ideological divides and politicized standoffs, which reached their zenith in Bush v. Gore. Five Republican-appointed Supreme Court justices voted along party lines to give the contested 2000 election to George W. Bush over Al Gore. Local judges campaign to be elected to the bench in many states, employing attack ads, fundraisers, and party platforms. Is this the endgame of partisanship in the justice system? The ad hoc parliamentary committee created to vet Canadian Supreme Court nominees appeared to many as a tame and toothless version of the US Senate confirmation hearings, but even it was abandoned after the Nadon debacle. The Conservatives appear to be more interested in gaining partisan advantage at the expense of the judiciary than in actually creating a partisan judiciary. One could (and perhaps should) look at legislation like the Truth in Sentencing Act as a vote of non-confidence in the judiciary and its values, or at the very least as a product of the different lenses through which the government and the courts view the justice system. Upholding judicial independence and judicial ethics might actually prevent us from having a real conversation about these differences of vision. Judges are discouraged in their ethical guidelines from commenting on matters of policy or taking public stands on issues that could be perceived as partisan; politicians similarly are prevented by the sub judice rule from commenting on matters that are before the courts. Being open about differences of opinion can be the beginning of genuine trust. In the United Kingdom, for example, judges are sometimes invited to appear as part of parliamentary committees looking into legal and justice issues. Could something similar be possible in Canada? What if judges had the opportunity to share their perspectives on the victim surcharge? This is altogether different from judges expressing views on the merits of a case. They have a distinct vantage point on the justice system, which ought to be part of the national conversation. At the same time, judges should not state their policy preferences or partisan loyalties, which could erode public confidence in their impartiality. As McLachlin’s clarifications emphasized, she felt it was her duty to flag a potential issue of eligibility for an appointment to one of the Supreme Court’s Quebec seats, not to comment on whether Nadon was qualified for said appointment. We witnessed a glimpse of this kind of open exchange with recent amendments to the not-criminally-responsible section of the Criminal Code. The federal government introduced a new high-risk category for individuals who, while NCR, still posed a danger to society and might be eligible for a release hearing every three years (rather than every year under the existing scheme). The chair of the Ontario Review Board, Justice Richard Schneider, spoke out against this policy, characterizing the new category as “draconian” and “unnecessarily harsh.” He was surprised that he and others involved in the justice community had not been consulted. Such candour from a judge (albeit one seconded to chair an administrative tribunal), was a welcome alternative to the kind of passive-aggressive unease that has become our new normal, where disagreements are expressed indirectly, through intermediaries like the media. Parliamentary committees may provide a helpful outlet to relieve some partisan tensions, but trust ultimately depends on having better structures and better relationships among our leaders. It is not impossible to implement credible and transparent structures for judicial appointments that would avoid controversies like Nadon altogether. For the past twenty years, Ontario’s provincial judges have been vetted through a non-partisan advisory committee that generates a ranked list from which the attorney general makes a selection. This system has weathered partisan shifts from the New Democrats to the Progressive Conservatives to the Liberals, and could serve as a model for a federal system. This kind of change requires political leadership. 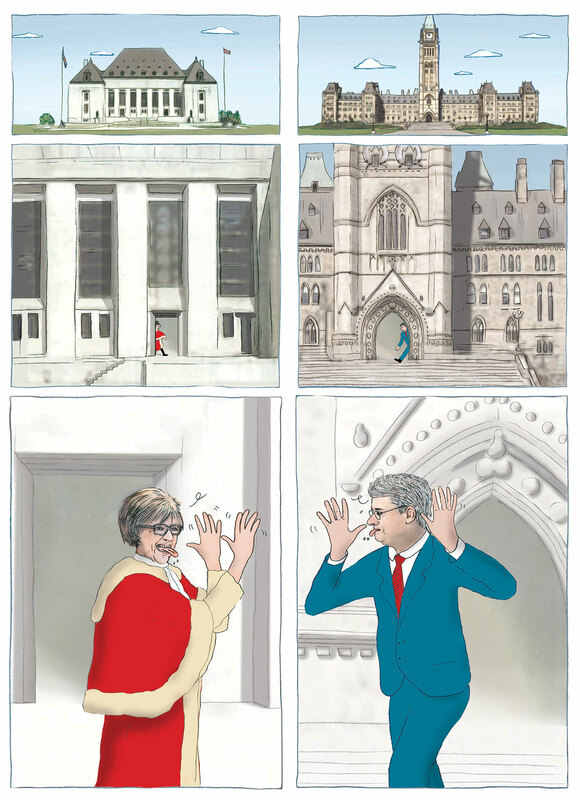 Prime Minister Harper has demonstrated flashes of it (and rose to power on a promise to redress the partisan excesses that brought us the sponsorship scandal), but on far more occasions, as in the attack on the chief justice, his leadership has been sorely lacking. Both the judiciary and the government should be trying to strengthen their relationship, not looking for ways to cut each other down. Perhaps the chief justice should give the prime minister a puppy. Nothing marks a new beginning like a bold gesture.